This time I am not sure if I have pictures of a new car or just pictures of a Daewoo which I do not know. At Incheon Airport I took these pictures on July 1, 2005. 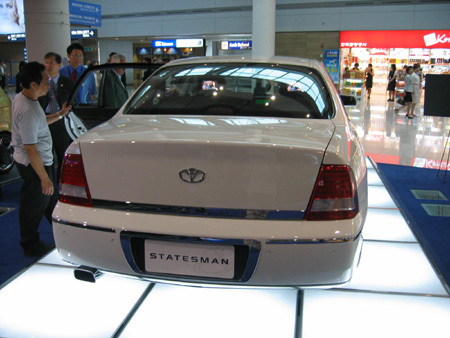 Big cars, dull shape and with stupid names (preferably in gray, black or white) are the proof that you are a successfull business man in South Korea. 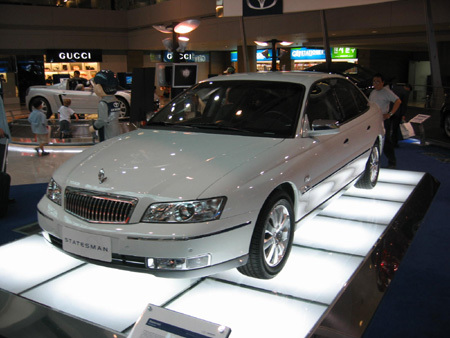 For example, did you ever hear of the Kia Potentia, or the Ssangyong Chairman? Probably not. 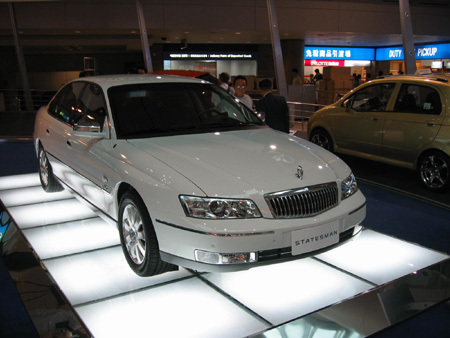 A newcomer in this list of ugly cars is this Daewoo Statesman. Design: yuk, colour: yuk, name: hilarious. In South Korea more than 95 procent of the registred cars are 'home made' cars. Not much fun if you like cars because of the limited variety. Everywhere you will see Hyundai, Kia, Daewoo, Samsung, Ssangyong on the road. Yes, even Samsung made cars but sold the automobile division to Renault, but they decided to keep the strong brand name, hahaha.